The Solar Immersion empowers students to realize their potential through the powerful embodiment of acrobatic partnership. 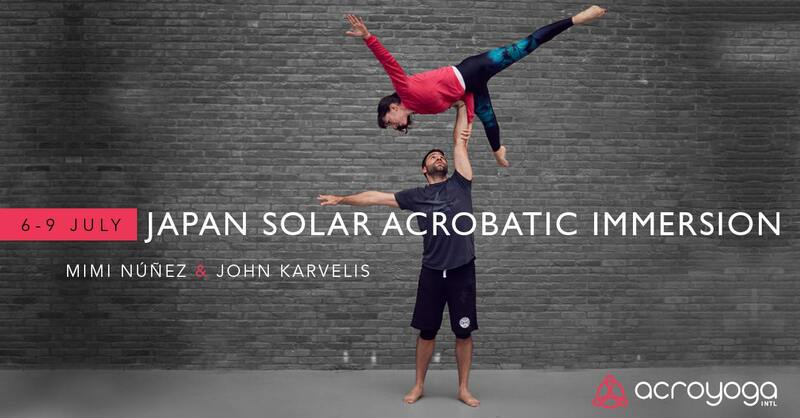 Join Millette Núñez and John Karvelis, with an amazing assisting team, for 4 full days of Acrobatic Solar training, connection & playful transitions. We are not just about achieving tricks (although we will definitely do that) but we are also very interested in creating a space where everyone feels empowered, embodied and fully supported. Linear progressions and an emphasis on the art of spotting make learning advanced acrobatics safe, accessible and fun. Confidence and coordination are developed in strength training and inversions, which pave the way for ease and grace in partner acrobatics. After refining foundations, we will train more precise acrobatic work, such as foot-to-hand, hand-to-hand and standing acrobatics. Get ready to lift beyond your goals in a fun and safe environment. …and if you are not sure if you are ready, just ask us and we will support you and find a way to get you ready! ***Prices subject changes slightly based on the daily currency fluctuations. You DON’T need to pay the full amount! You can secure your spot with a NON refundable deposit of $265 and pay the rest in cash upon your arrival. If this doesn’t work for you connect with us to find another method for you. Although you are welcome to give your spot to someone else at any time, the deposit is not refundable. For people paid the full amount: 40 days prior full refund minus $50 processing fee. Within 40 days to one week before= 1/2 back. A week before or during event, no refund, no exceptions. Mimi has been traveling and sharing her love for acro worldwide since 2012. A seasoned teacher, she understands the importance of setting high standards while simultaneously building people’s beliefs in their own capacities. She creates an environment in which students are challenged, feel safe to take risks and are supported to learn. Known for her positive demeanor, high energy and encouraging style of communication, Mimi loves to have fun and remind others how awesome they are. She is a teacher trainer and immersion/intensives teacher for both Acroyoga.org and PartnerAcrobatics.com. She loves Hello Kitty and good coffee. John met and introduced to the world of yoga accidentally by a friend while working in engineering in Athens. Since then his life changed completely. He is a certified Acroyoga.org Level 2 and Immersion teacher, Certified yoga teacher (Hatha yoga and Vinyasa krama), Thai Yoga massage therapist trained by the Sunshine network and co-founder of the AeriaLife training. He loves to combine the strong elements of acrobatics, the healing arts and the people’s connection in groups, with the best contact quality in body and mind.